Two mobile carriers from South Korea and the US held the world’s first live hologram international call service via the companies’ fifth-generation networks on Monday, testing the future of the telecom service industry. 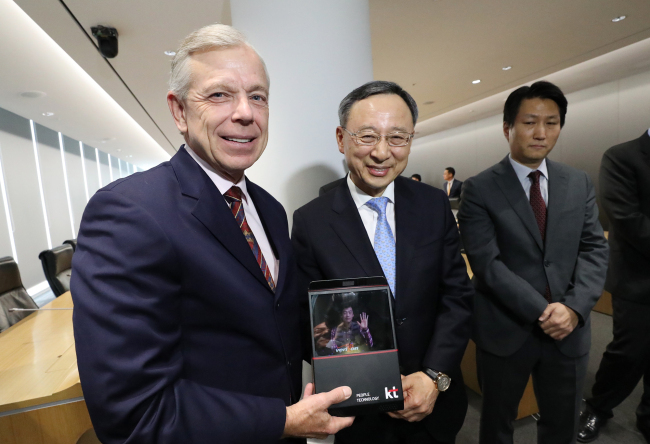 The demonstration came as the heads of the two companies -- KT CEO Hwang Chang-gyu met Verizon CEO Lowell McAdam -- held a meeting in Seoul to discuss ways to expand bilateral partnership on services under development including a live hologram video call. In the demonstration, a KT employee held a meeting with a Verizon employee who appeared as a hologram image on a monitor in the KT headquarters building. It was the world’s first successful end-to-end 5G network interworking, according to the two firms. Both 5G trial networks were deployed over a 28 GHz spectrum. KT is developing the hologram live call as its flagship 5G-based immersive media services along with Sync View, 360-degree Live VR and Omni-View services that are being studied by the International Telecommunication Union. Global cooperation on the 5G network is essential to enabling the hologram live service that requires high data rate, massive traffic volume and low latency on a worldwide scale, according to KT. The two companies also tested interconnection of their orchestrators, a key system to control virtual infrastructure resources, based on the software defined infrastructure, known as SDI, for the first time. Both companies plan to jointly propose the specification of the orchestrators as an international standard. According to market research institute SDxCentral, the related market size is expected to reach $105 billion in 2020. KT’s Hwang said the two firms will elevate their cooperation from technical development to launching complete services. The Verizon CEO also met with SK Telecom CEO Park Jung-ho on the same day and discussed partnerships on the standardization of 5G technologies, co-development of solutions for the 5G Automotive Association and the exchange of Internet of Things platforms. Verizon and SKT will enhance collaboration particularly on 5G-based connected car technologies, the two firms said. They agreed to co-develop SKT’s vehicle to everything technologies, known as V2X technologies, and other telematics solutions. “SKT will continue working with world-class telecom companies to move forward the standardization of 5G technologies,” said SKT’s Park. Park is also set to meet with Tim Hoettgest, chairman of Deutsche Telekom, next Tuesday to talk about collaboration in the artificial intelligence business.